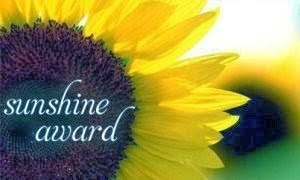 This is the Sunshine Award! Name ten things about yourself that others might not know. With that being said I would like to thank Spencer the Goldendoodle for giving me this amazing award! I encourage you to check out his blog. He's really, really cute! 3. My favorite food is butter. 5. My eyesight isn't all that good. One time I barked at a basketball lodged under a car because I thought It was a kitty. 7. I lack common sense when it comes to running loose. I just follow my nose. 8. I don't know what would happen if I caught a squirrel. 9. I like blogging because I like the attention. So those are some of my secrets and some things people don't know about me. Now for the hard part: There are so many blogs that have touched me and have impressed me. I love reading other animals' stories. For this award I decided to pick some of the cutest dogs from the blogosphere. I love cute! Now, I know there are many other cute dog blogs out there. But I'm tired. This was a hard job. I think I need a nap now! Thank you again to Spencer the Goldendoodle and please check out the blogs that I have nominated. Tell them that Cinnamon sent you! Cinnamon says.. "You are more than welcome... If you want English lessons sometime, let me know!"